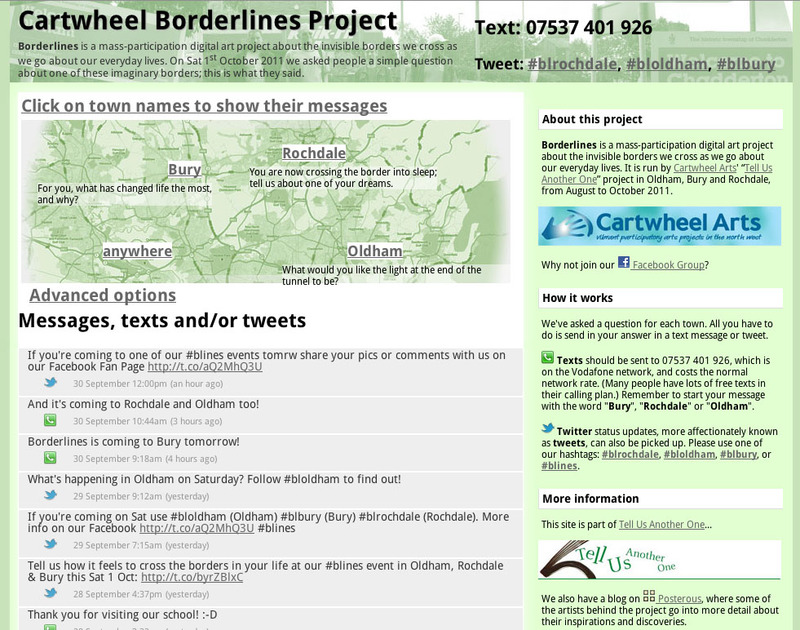 This summer, I took on a role as an artist, developing and delivering workshops leading to a mass-participation digital art project called Cartwheel Borderlines Project. Starting August 2011, I became involved with Cartwheel Arts community arts group in Heywood, Manchester, as part of a new team of artists. We planned out eight sessions customised to three groups of young carers or people in a similar position. Over these sessions, the plan was to help the indivuduals develop their confidence in digital technology (specifically sending an SMS text message or writing a Twitter ‘tweet’), develop their condfidence socially, to be creative using writing, story telling, crafts and drama, and also to have a bit of fun. The common theme throughout the sessions was borderlines, or what borders mean and how we cross them, or don’t cross them. Combining these goals was our overall plan, to create a piece of mass-participation digital art. Inspired by such projects as Shift Happens and Manchester Time Piece, we decided to use our them of borderlines by getting each of the three groups to build a border-post or archway, erected in their local town centre of Bury, Rochdale and Oldham on 1st October, and ask anyone who passed by a simple question. The question was again to do with crossing borders, and time in the workshops had been allocated to developing the best question. The answers to the three big questions, plus answers to questions from the workshops, are still up on the site. Have a look around, there are some really moving responses, some funny ones, and some quite personal remarks — easier to be personal in anonymous communication. We ran a plenary session after the project ended, which was an opportunity to use some of the answers to write cut-and-paste poetry, as well as an evaulation excercise. These poems, plus writings and photos from many of the other sessions, are on the Borderlines Project Facebook group. A little technical detail about the web platform. 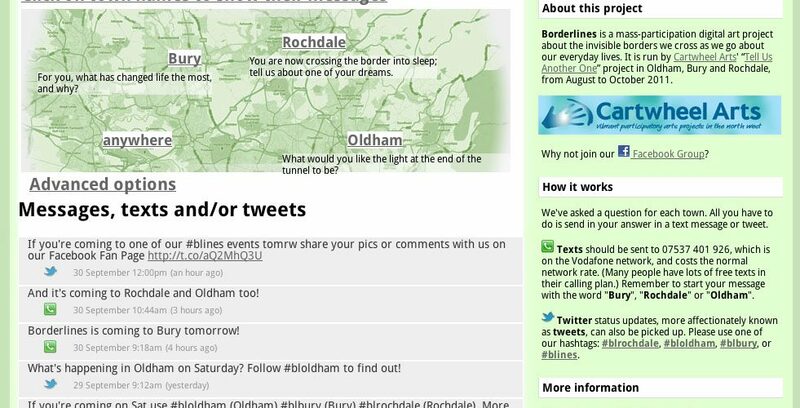 The site is built in PHP with a MySQL database, plus services polling Twitter for latest messages using our hashtags. The SMS receive function from a Vodafone number has been manually crafted into this. The front end is a 960.gs grid frame, HTML/CSS header and sidebar. The messages inside are loaded from an AJAX call every few seconds. There is some animation using JQuery.